Grangetto's Farm and Garden Supply Services - » Who Says Money Can’t Grow on Trees? Well, it may not be actual money, but this plant may be lucky! The money tree is also known as the Malabar chestnut. It is easy to grow and is commonly used in feng shui to produce positive vibrations and attract prosperity to its owner. It is native to the swamps of South America and will not tolerate temperatures below 28°F. This combined with no need for direct sunlight, makes this lucky plant perfect for your house or porch. You can often find these fun plants with their twisted trunks and lush green leaves at garden centers. They like rich, well draining soil such as a potting soil made for cacti. Kellogg® Palm & Cactus Mix would be a good choice. Use a pot with holes in the bottom so the soil can drain. Do not use a pot that is too large. Using a smaller pot will keep you from over-watering and causing root rot. Root rot signs are yellowing and dropping of the leaves. Keeping your money tree in the same pot will keep your plant at a good small size. In order for your money plant to continue to grow larger (that is if you want it too), you will need to replant in a larger pot every couple of years or so. They prefer minimal sunlight and can grow indoors in full shade. If the tree does begin to wilt, move it to a location with some indirect sunlight. Water thoroughly and allow the soil to dry out a bit between waterings. They like their water similar to that of a plumeria, in big gulps. Water thoroughly until water comes out the drainage holes of your pot. Allow the top 1 – 2 inches to dry out between waterings. Avoid getting water on the trunk. Cut back on watering in the winter when growth slows. 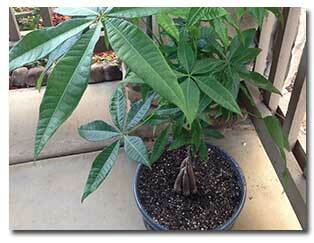 Feed your money tree plant with a balanced liquid fertilizer during the growing season (spring through summer). Fertilize twice a month or according to the label instructions. Do not fertilize during the winter months. While regular pruning will help control it’s size, it won’t hurt the plant if you don’t. The trunk of the tree is made up of separate braided trunks. At the top of the trunks, branches extend. If you are growing your money tree larger, braid the tops of the bottoms of the branches as they grow out beyond the braid. Continue this pattern to keep your tree growing straight. Pinch or prune off growing tips. 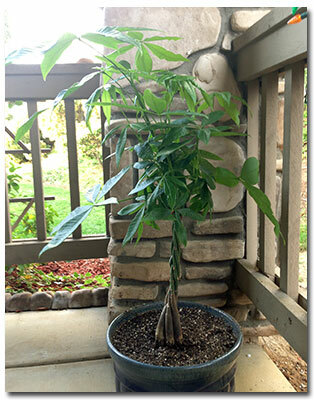 According to feng shui, money tree will bring good luck and fortune. No, your money tree plant won’t actually sprout dollar bills, but it is a relatively easy-to-care for houseplant and fun looking. With a little water, food and care, you’ll enjoy this amazing tree for many years. Light: Bright light, but no direct sun. Thrives under fluorescent light. Water: Money tree plant likes water in big gulps. Water thoroughly, until water comes out the drainage holes in the bottom of the pot, then allow the top 1-2 inches (2.5-5 cm) to dry out between waterings. Avoid getting water on the trunk, which causes stem rot. Water less in winter. Humidity: Moderate to high. Try to keep the relative humidity at 50% or higher. Set the pot on a tray of wet pebbles to raise the humidity around it. Soil: Use a peat moss-based potting mix with perlite or sand added for good drainage. Fertilizer: Feed every 2 weeks in spring and summer with a balanced liquid fertilizer diluted by half. Propagation: Seeds or stem tips. Take stem tip cuttings in spring, with at least 2 leaf nodes attached. Dip the cut end in rooting hormone powder then place it in moist potting mix. Be patient — it can take several weeks to root.